Few things are such a kvell opportunity than when every kind of Jew is able to learn respectfully together. So we're thrilled to announced that "Limmud" is coming to Philadelphia! LimmudPhilly is a panoramic, Jewish communal "learningfest" which engages new and seasoned learners in an open environment inspired by wisdom, enthusiasm, and a love of learning. Starting Saturday night February 21st and all day Sunday February 22nd, over 70 phenomenally diverse, talented teachers and innovators will offer sessions for all levels of learners and every kind of Jewish person and our significant others at the Gershman Y campus. 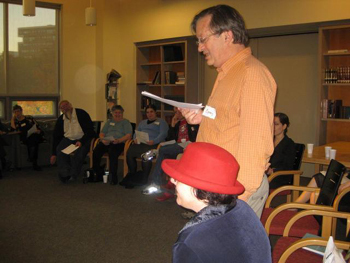 LimmudPhilly is a multi-age, multi-faceted, multi-dimensional dynamic look at the panorama of Jewish life. Sunday will include a comprehensive schedule of programming for children ages three and up, with additional special sessions for teens. Kashrut is observed throughout. Continental breakfast, lunch and snacks will be served. Registration fees are modest due to philanthropic subsidy, Adults - $54; Adults Under 30 - $36; Children and Teens - $18. Register at Limmudphilly.org. Taught across the vast landscape of Jewish history, text, art, culture, politics, spirituality, and life through a variety of dynamic learning approaches sessions include lectures, workshops, group study, films, meditation, concerts and Torah yoga. LimmudEngland attracts thousands because the ahavat yisrael -respect and love among diverse Jews: Orthodox, Conservative, Jewish Renewal, Reform, Reconstructionist, Havurah, Humanist, Folkshul, atheist, agnostic, republican, democrat, half Jewish and married-to-Jews and alienated but still curious folks who attend - inspires awe. The model is already active in Atlanta, Los Angeles, Denver, Holland, South Africa and Russia, to list just a few places where seeds of Limmud have taken healthy root. My first Limmud experience was in England, where it all began. Invited to teach four seminars during Christmas week, I was astonished to meet teenagers and young parents who told me they'd been attending without a miss since they were born. Not only that, many were newly curious about their Jewish roots and attending because Limmud is a safe place to come as you are. Questions, doubts, curiosity and views are all welcome and made room for. That conference was at Nottingham College (yup, Sheriff of…) and they had a bar in the center of it all with beer flowing and singles and couples mingling and talking about……….Jewish life and learning. Over 2000 Jews and not one Christmas tree in sight for a week. Every age thoroughly represented and entertainment so top notch each night, who wanted to go to bed? Thinking back on hundreds of conferences I've attended as a rabbi and former Jewish Federation director, all I could think of was wow, there's more to attend than there's time to do! It's all so friendly and fascinating. Why can't we have this in Philly? Under the dynamic leadership of 2009 Co-Chairs Rabbi Lauren Grabelle Herrmann and Rita D. Siegle the steering committee includes a broad cross-section of the Greater Philadelphia Community: Barbara Black, Craig Russell Blackman, Brad Denenberg. Sue Jacobs, Annsley Klehr, Joyce Krasnoff, Hon. Anne E. Lazarus, Yael Levin, Sara R. Levy, Annabel F. Lindy, Philip B. Lindy, Rabbi Goldie Milgram, Robert Neff, Harriet Potashnick, Curtis J. Roth, George Shotz, Jerry Silverman, Audrey L. Zapletal-Berkowitz. Staffing is by Ross Berkowitz. Miss Lisa, Inc. an educational interactive acrobatic performance company that uses circus arts to teach Jewish topics and values. She is a member of ROI 120's international community of innovative Jewish leaders and won a "Free to be Expressive" contest sponsored by Cirque du Soleil. Mitch Chanin, Director of the Jewish Dialogue Group, an organization that was founded in Philadelphia in 2001 to foster constructive dialogue within Jewish communities about the Israeli-Palestinian conflict and other difficult issues. Tamar Kamionkowski, author of Gender Reversal and Cosmic Chaos: Studies on the Book of Ezekiel and a range of publications on biblical studies. Daylin Leach, democratic senator-elect for the 17th senatorial district of the Pennsylvania State Senate. Dr. Elliot Ratzmanrms, Swarthmore College &am, Swarthmore College & Princeton University, who writes about philosopher Emmanuel Levinas, the Mussar tradition, liberation theology, and other tools for tikkun olam. Saul Wachs Gratz College, has lectured in almost 400 communities on five continents. Chava Weissler, Professor of Jewish Civilization at Lehigh University, where she teaches courses on Jewish Folklore, Hasidic Tales, Kabbalah, New Forms of American Judaism, and Death in Religious Traditions, author of Voices of The Matriarchs. Dr. Yechiel Schur, Director for Public Programs at the Herbert D. Katz Center for Advanced Judaic Studies and teaches at The University of Pennsylvania. Ira Stone of Temple Beth Zion-Beth Israel in center city Philadelphia author of "Seeking the Path to Life", "Reading Levinas/Reading Talmud" and "A Responsible Life: Musar As A Spiritual Path"
Goldie Milgram, author of the Jewish Lights Reclaiming Judaism Trilogy and Living Judaism Editor for the Philadelphia Jewish Voice. Whether you too wish to be a presenter at PhillyLimmud (a few teaching slots continue to be held open for local applicants) or to register and hold a space, the event is expected to sell out, visit Limmudphilly.org.